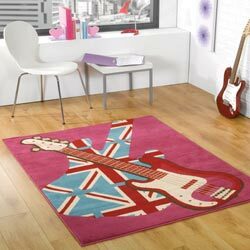 Retro Funky rugs are ideal for children's bedrooms, especial older children who no long appreciate a fluffy sheep or road rug on their floor!! Retro funk offers designs like Union Jack, London bus and so on, each design is colourful and easy to match with various soft furnishings. All rugs in this range are machine woven in Belgium, the pile is made from 100% Polypropylene which has the following benefits:- colour-fast, anti-static, easy to clean, moth-proof and hard wearing.